The light vegetarian appetizers I made last night are so easy, tasty, and cost next to nothing. Since I had a big chunk of winter melon (or "togan", in Japanese), I decided to whip up a healthy soup with it. Winter melon is used in many "Shojin" style (Buddhist-style vegetarian) or "Yakuzen" (medicinal - cooking for health benefits) dishes. I love it so much. This soup is a completely vegan dish. Just 3 ingredients! In a pot, pour just enough dashi stock to cover the winter melon. Simmer at medium-low heat for 15 minutes or the winter melon is cooked through. Transfer the winter melon and the dashi stock into a blender and blend until smooth. Season with salt. 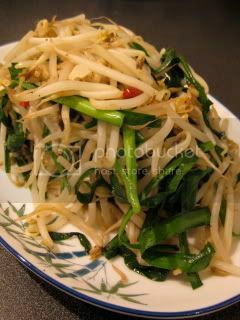 I totally love the simplicity of stir-fried bean sprouts. When I go to a hole-in-the-wall kind of ramen stand in Japan, this is something I order to start with. Including the preparation, it takes less than 10 minutes to make this dish, so this is a "bachelor-friendly" dish, too. In a wok, heat the sesame oil at high heat. Add the bean sprouts and stir for 45 seconds. Add the nira and dried red chili peppers and continue stir-frying for another 45 seconds or until nira is wilted.